Speed limits may be going up to 75 possibly 85 m.p.h. on rural highways around the state next year. That may include parts of U.S. 127 and I-69 in Mid-Michigan, but busier stretches or road aren't going to change. It's part of a series of bills passed by the House Transportation Committee on Tuesday. Rep. Brad Jacobsen (R-Oxford) is behind the bill, and even he admit's to a heavy foot. "I have to keep up with traffic," Jacobsen said. He says studies have shown 85 percent of drivers go faster than the speed limit on rural stretches of highway. Jacobsen is arguing raising the speed limit even higher would keep traffic flowing, and in turn make roads safer. "People drive at a speed they feel comfortable for the road design and the road conditions," Jacobsen noted. 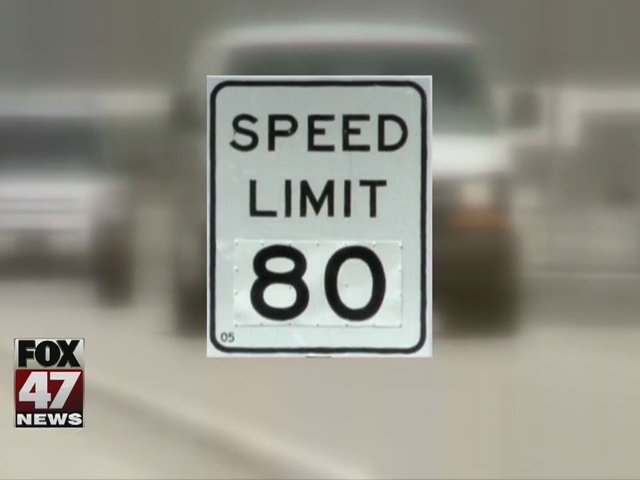 The Michigan Department of Transportation t hasn't said if it's for or against the change, but a spokesman tells us raising the speed limit will take more than new signs, since road conditions like curves and hills need to be considered. "It would be a higher expense in most areas taking the roads to 80," Jacobsen added. The bill would even let state police up the speed to 80 on some highways based on safety studies, but Jacobsen says busier highways aren't built to handle that speed. "I would not expect changes through most of the I 96 corridor," he added. The bills would also let county road commissions with more than 1 million residents reduce speed limits on gravel roads from 55 m.p.h. to 35 m.p.h. Superintendents could set the half-hour before and after school times when the speed limit can drop up to 20 m.p.h. lower than the posted limit. The bills are now on the House floor where lawmakers expect a vote in the next two weeks.